As a course designer (instructional designer) I have, I feel had a more natural flow with the processes that I follow in the development of a new course. However over the past few months I have been looking at different models of course design in more detail to help me to improve my own personal practice. 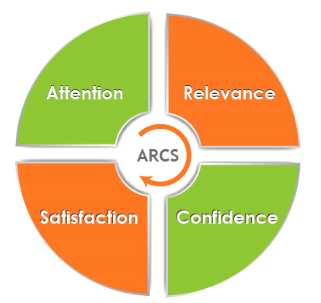 In a previous article I looked at the ADDIE model, in this article I am going to look at the ARCS model. This instructional design model was created by John Keller, and is based on the theory that learners are motivated where there is value in the knowledge or skills being presented to them. This desire to learn is also enhanced where the learner is confident that they will succeed. The model itself consists of four areas, these are Attention, Relevance, Confidence, and Satisfaction. I will look at each of these in turn. This is referring to the level of interest that is displayed by the learners in the material. By commanding the attention of your learners the amount of information retained is drastically improved. If you are able to grab the attention of your learners this is a great initiator of motivation. Once learners have a interest in a topic they are much more likely to engage in teaching activities and invest their time to the learning process. we are trying to create perceptual arousal, using surprise or uncertain situations; this can be done using variability, using a variety of resources and methods of teaching. The ability of a learner to identify how the material may be relevant to them is key to helping them to engage. When a learner finds it difficult to establish how the particular material being presented will have an impact directly on them as an individual or help them in a given situation they may find it harder to engage with the material. John Keller presented three methods to achieve this, these are goal oriented, motive matching, and familiarity. Learners will throw concepts away if their attention cannot be grabbed and sustained and if relevance is not established. Building confidence within learners is a vital aspect of establishing a positive relationship with the material and ensuring high levels of interaction. As we are all aware higher interaction and engagement with material often leads to a much deeper level of understanding and retention of the material being conveyed. The use of assessment (both formal and informal), feedback and positive reinforcement can greatly help learners increase in confidence in their ability to work with the material being presented. If learners obtain some type of satisfaction or reward from a learning experience, they are more likely to retain and use the material. It can also help to improve levels of future engagement and individual confidence as a learner. Application and evaluation of their ability can be a great way to gain a level of satisfaction via the ability to demonstrate and discuss their new found skill. The understanding of various different models of learning and course design can help us as educators to improve our offerings and help our learners gain the very best from our course offerings.